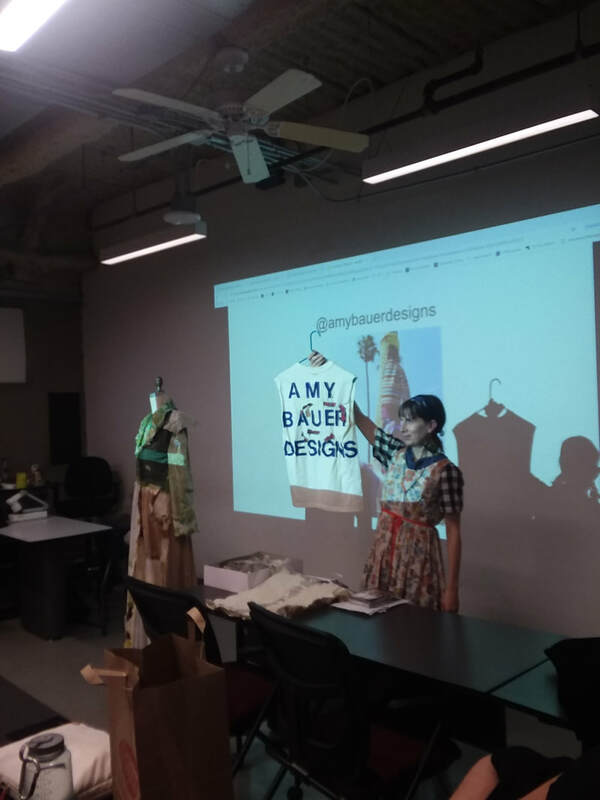 Images below taken at Otis College of Art & Design where Amy was a guest Wearable Artist/Activist/Change Agent. Voice of the Village, Tujunga, CA May 2015 Eco Art show. 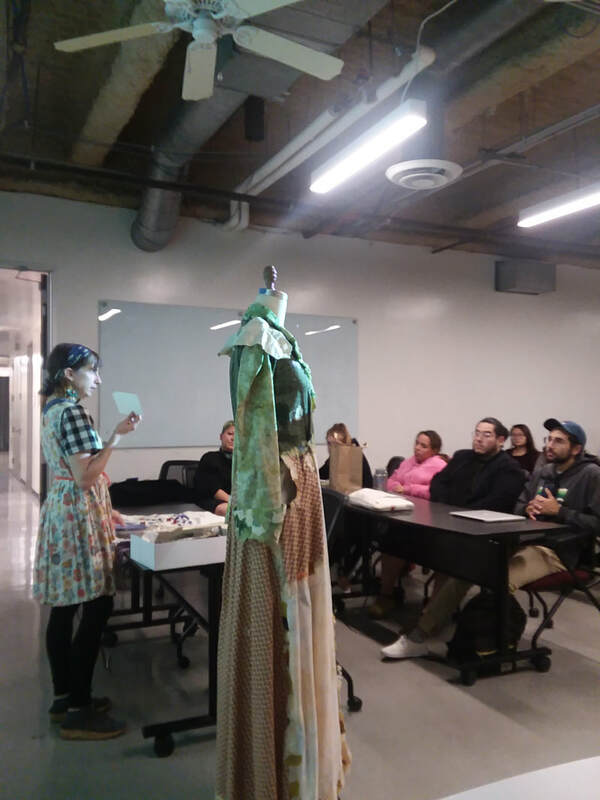 ​**Interested in conducting art, crafts and/or sewing workshops? Amy can create one-of-a-kind activities suitable for yourself, children, adults or a companies mission. Send her a message at amybauerdesigns(AT)gmail(DOT)com and let's discuss opportunities. 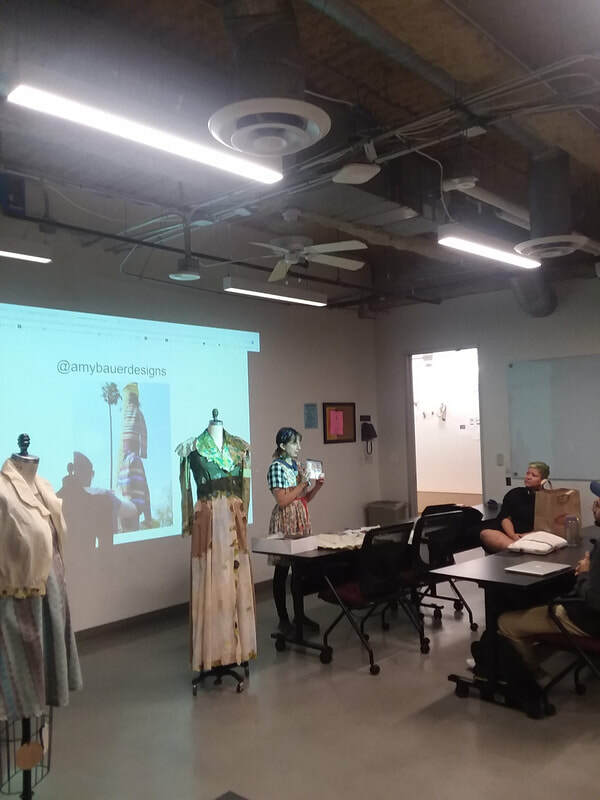 Institutions I work with include Elizabeth's Canvas, JCC Manhattan, reDiscover Center, Trade School Los Angeles, Transition Culver City, Otis College of Art & Design, Paniolo Productions, Yarn Bombing Los Angeles and I would love to work with you! My husband and I started our own company. Dreameco Crafts and have been working at the Santa Monica Main Street Farmer's Market. We also work with Our Time Bank & Transition Culver City at the Westside Regional Repair Cafe and are adding companies every day! Check out our Facebook page (www.facebook.com/dreamecocrafts) to locate us! -Wearable art inspired by and including Full Circle: re-birth of a tree were shown in Lancaster CA at the Museum of Art & History, May 2018. -One of my paintings is featured on The Art of Rose Falcone. The post is titled, "Amy Bauer's Art for the Holidays". It is quiet the honor. December 2015. - I'm interviewed in the Argonaut (http://argonautnews.com/art-follows-commerce/) for the Mar Vista artwalk - Steppin Into the Art of Mar Vista and about Dreameco Crafts! "Artist Amy Bauer, who will run the art walk’s eco-friendly scavenger hunt, recently started a craft business with husband Richard Hecht and also thinks that something special is happening in Mar Vista. "Mar Vista is at that perfect point where artists can make their own items and get out in the community,” says the recent New York-transplant, who moved from Brooklyn two years ago after witnessing that neighborhood’s shift from an artist’s enclave to a pricy borough out of reach for many in the creative class." November 2015. 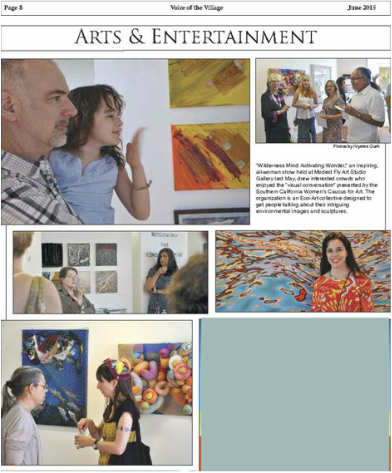 - My art made the local Tujunga, CA newspaper. I had three pieces in the Eco Art Chapter of the SCWCA. Two of my pieces are behind the man and child and I am talking to a friend in another photo. Very exciting and an honor to be chosen for the show that happened in May 2015. - I volunteered as a sewing teacher for a great event. So-In, Sew-In: Celebrating the advent of Culver City's plastic bag ban sponsored by Transition Culver City. 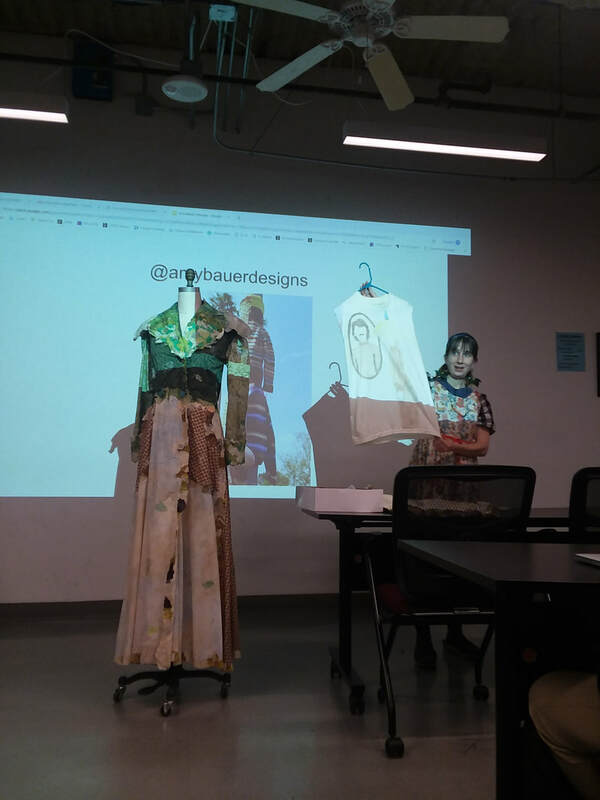 I taught people how to create reusable bags from repurposed t-shirts. A fun way to spend an evening and a fantastic way to meet new people. December 2014. -On March 1, 2013 I received an email notification of my acceptance of a proposal I wrote to be an artist for Sing for Hope. A public art event that took place summer 2013 in NYC. Read about my experience receiving that email on my blog plus the covering of the piano in music sheets! http://amybauerart.wordpress.com. From June 1 -15, 2013 the upright piano that I painted and covered in old sheet music had been on display in NYC for the public to play and view. On June 16, 2013 it was transported to the Josie Robertson Plaza at Lincoln Center for a celebration with 87 other pianos! Here is a write up about my piano on the Fashion Institute of Technology Art and Design blog: http://blog.fitnyc.edu/artanddesign/2013/06/13/she-took-one-refurbished-piano/ The piano was donated to Visions in NYC an establishment to help the blind and seeing impaired.